In Turkey, nutritious purslane is mixed with strained yogurt and garlic and served as an starter, or 'meze.'. Have you ever heard of purslane? Purslane is a green, leafy vegetable sometimes considered an herb or a weed. It has been present in many ancient cuisines all over the world for thousands of years. Different cultures have different beliefs about its nutritional and even spiritual benefits. In reality, purslane is very good for you. It's high in vitamin C, and believe it or not, Omega-3 fatty acids! That's a weed to be reckoned with. Here is the recipe for one of my favorite cold Turkish 'meze' dishes that features purslane. As in many Mediterranean and Middle Eastern cuisines, purslane is also common in Turkish cuisine where it's used in both hot and cold dishes. 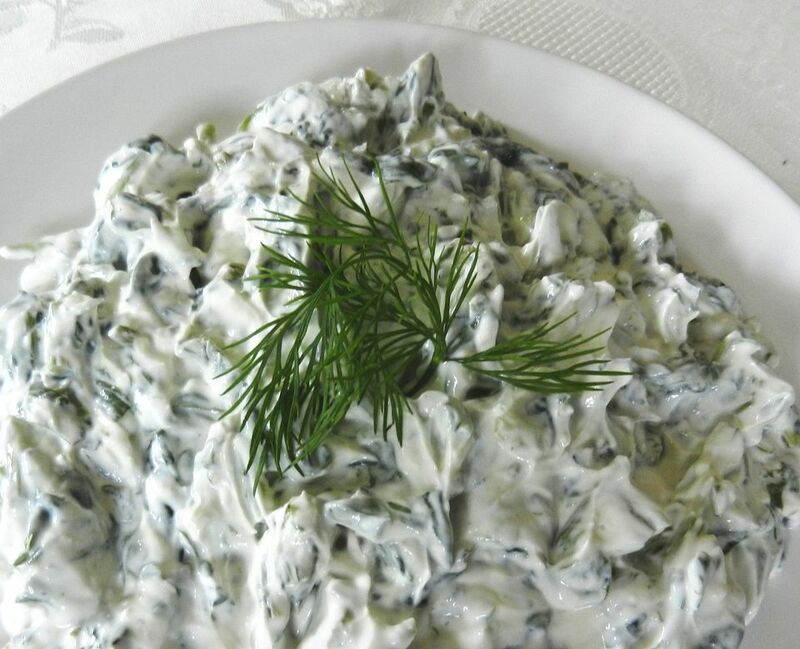 In this simple recipe, fresh purslane leaves, or in Turkish, 'semizotu' (sem-EEZ' oh-TOO'), surrounded by a whip of thick, creamy strained yogurt, similar to Greek yogurt, and crushed garlic. The tangy crispness of the fresh purslane goes perfectly with the yogurt and the garlic adds extra punch. This dish is wonderful served as an appetizer or salad. It's great spread on toasted bread, crackers or eaten straight up by the forkful. It's also very quick and easy to prepare with only a few ingredients. You can find fresh purslane in farmers markets and specialty greengrocers. Sometimes, you can even find wild purslane growing in your own backyard. First cut off any roots from the purslane. Wash and drain it twice to make sure there is no soil or grit left on the leaves. In a separate bowl, whip together the other ingredients using a wire whisk until smooth and creamy. Adjust the amount of salt and pepper to your taste. Serve immediately, or cover and chill it for several hours or overnight. The flavor actually gets better if the salad rests for a while. Gently stir it again before serving.